I came across a BBC TV show recently. I'd heard about it before, but never watched. It's sort of like Law & Order: Georgian England. Garrow's Law takes place in late 18th century England. William Garrow is a young barrister. 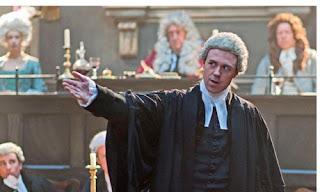 He becomes an Old Bailey lawyer case by case, bit by bit, challenging the accepted methods of trials and defense attorneys in Georgian England. Watching the show adds another dimension to Georgian England, one that's more about the normal people rather than the upper classes. William Garrow was a real historical person, who introduced the phrase "innocent until proven guilty," among other legal innovations. Garrow, in real life and on the show, is shown to have an aggressive cross-examination style and an unconventional way with evidence. Here's a 20-minute documentary about Garrow and Garrow's Law: William Garrow: Fact and Fiction. 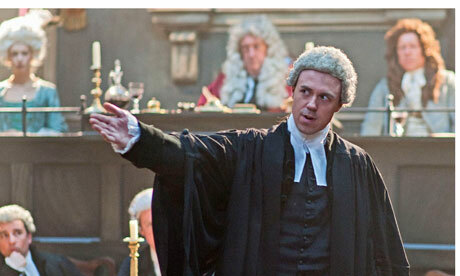 The cases on each episode of Garrow's Law come from the archives of the Old Bailey, London's central criminal court. Here is the fully searchable database of the Old Bailey. 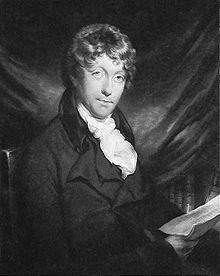 Though the historical Garrow did not work on all of the cases shown on the show, the cases were real and among the most famous cases in Georgian England, such as the trial of James Hadfield, the man who attempted to assassinate George III in May 1800. Hadfield was acquitted by reasons of insanity, though in real life, Garrow worked for the prosecution on this case. In episode 2, Garrow must defend a man accused of being the London Monster. Although the monster stabbed several women, that's not what the man is indicted for, bodily assault being a misdemeanor at the time and the criminal would only get a pillory. He's indicted for the cutting of the clothing the women he stabbed wore. Going back to a 1721 law, the cutting of cloth was a felony and the convicted could hang. Or the government's suppression of what they considered to be "radical" groups, such as the London Corresponding Society. The 1790s were a time of societies and clubs trying to abolish slavery, expand suffrage to all men, change Parliament, etc. But as the French Revolution got on, the establishment got nervous and Parliament began to pass a lot of laws against assembly and about seditious acts. Or the Zong case. The Zong was a slave ship. In November 1781, the captain ordered his crew to throw 142 Africans into the sea because the ship was running low on water. The slaves were insured as cargo. Killing some of the slaves meant that an insurance claim could be filed and money collected. The Zong case inspired the Quakers to begin campaigning in earnest for an end to slavery. The actual William Garrow did not have anything to do with the real trial.